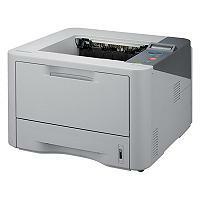 This printing powerhouse will increase productivity in your office. With a print speed of 37ppm, the power of a 600 MHz Dual Core processor and expandable memory of up to 384MB, you’ll get more done in less time. Measuring 14.4”x 14.5” x10”, it’s smaller than most monochrome laser printers on the market and fits on your desktop without taking up too much workspace. The Samsung ML-3712DW connects you to Wi-Fi with a single touch. Simply press the Wi-Fi Protected Setup button on the control panel and you’re connected. No manual configurations or complicated pass codes are required. Just one touch of the ECO button customizes your printer output so you save on toner and paper. You can convert printouts to two or four pages per sheet and enable duplex printing. With the unique Result Simulator you can see exactly how much CO2, electricity and paper you save with your selected settings.